The healthcare industry takes care of our children, parents and our patients. Daycares and aged care facilities, preschools, and more take the people we love the most and keep them clean and fed. That can’t happen without the proper healthcare wipes. TIDDOX makes its HEALTHCARE HEAVY DUTY CLOTHS with an antibacterial agent that inhibits the growth of germs in wipers, which enables you to can use these cloths longer, because this agents slows and prevents bacteria settling into the cloth and making it stink. This is a more sanitary solution than a simple paper towel or a laundered cloth that may or may not have been bleached. These healthcare cloths also have a high viscosity rating, which means they will absorb the less-than-pleasant results of healthcare – blood, urine, feces, and vomit all have different absorbency rates, and our heavy duty cloths will soak up all of them. This alone is enough to make these towels invaluable, but when you combine their absorbency with the fact that they are disposable, you have a perfect match! These large, thick towels can be moistened and used to clean off someone’s face and hands, or can be soaked with solvent and used to scrub up a dried mess. 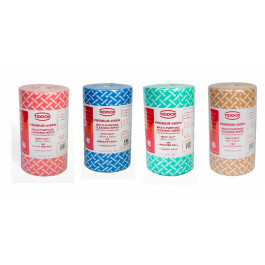 You get 90 wipes on each roll, and you can order from three colours: Red, Blue or Green. Some healthcare facilities order different colors for each department. Your order will have 4 rolls of 90 wipes each. We really think that if you will try this product, you will want to keep it on hand in your daycare or aged care facility.